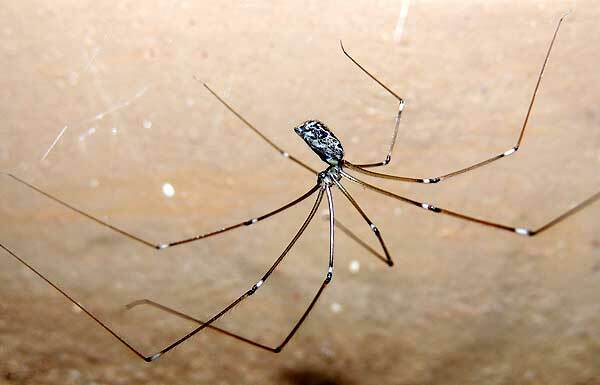 Observed at night, exterior of a building in Kitale, Kenya. January 2014. Length, not including legs, about 9 mm. Cellar spiders original habitat before taking up an association with humans, was likely caves - the same caves that our ancestors used for habitation. They, along with a whole suite of arthropods, moved along with us to our manufactured housing. Indeed these spiders often prey on insect pests that have had a long history with human habitations. When disturbed these spiders will violently shake their irregular web which will serve to repel or even capture an invader.